• We invent electronic music, satellite, spaceflight, videotape recorder, radio, helicopter, hydroplane, solar cell, power transformer, synthetic rubber, combine harvester—and still have to steal our technology from the West! 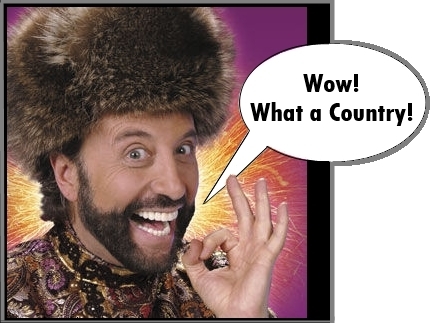 Notes: Chernobyl and Yakov Smirnoff were Ukrainian. This entry was posted in humor and tagged ethnicity, jokes about Crimea, jokes about Putin, jokes about russia, jokes about Ukraine, national character, Russian jokes, Soviet, Ukraine by Alan Brech. Bookmark the permalink.